Dubbed the Think Bike workshop, the Dutch Bike Embassy, Austin city staff, private sector engineers, planners and citizens biked our streets, identified trouble spots and strategized transportation planning to get more people on bikes. Last week, the efforts of the Think Bike workshop were unveiled at City Hall, and Austin got a glimpse of how our roads may look in the future. Converting short car trips into bike trips was a main emphasis during the workshop. The Dutch Cycling Embassy conducted a mobility scan (Austin is the first city outside of Europe to do so) so that we could get a quantitative look at short car trips in the downtown and South Lamar areas. 1. Coherence?You should never be bicycling along a route and suddenly find you don’t know where to go. 2. Directness?The route should be direct and directly serve destinations. 3. Attractiveness?Extra lighting, greenery, smooth roads and roominess make riding a bike much more enjoyable. 4. Safety?There should be ample space in the bike lane and protection by a barrier of some sort in high traffic areas. 5. Convenience?A good quality route that serves people directly. Sidewalks were not designed for bike travel and should not be considered the better alternative. You can find the full presentation from the workshop here, but some of my favorite ideas from the workshop are noted below. Guadalupe St & Lavaca St. These are one-way, 4-lane, high speed traffic streets that do not have independent bike lanes. They’re perfect candidates for a 2-way facility. 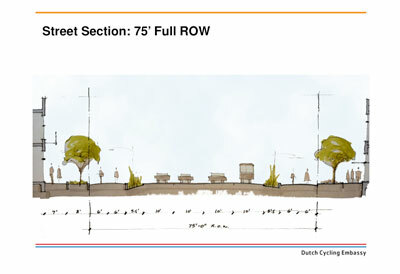 From left to right, the sketch shows a sidewalk with trees, a 12 foot 2-way cycle track, a two foot barrier, a bus lane, three 10 foot auto lanes, and another sidewalk with trees. I can’t tell you how happy I am about this one. Crossing I-35 frontage road during rush hour takes nothing less than a miracle. Here, a tunnel may be in our future, but a pedestrian/cyclist controlled crosswalk may be installed in the interim. Over 35,000 vehicles travel this road each day. Some are commuters, and some are short trip users. A five-foot striped lane is the only thing keeping you from very fast moving traffic, and I can tell you as someone who bikes everyday and frequents the South Lamar businesses, biking on South Lamar is downright scary. 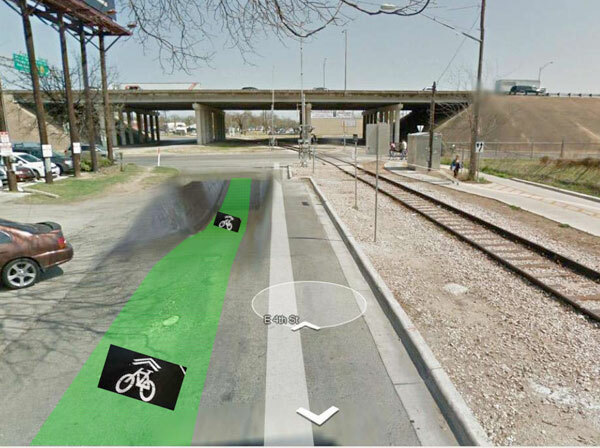 Having protected bike lanes would be life-changing for everyone who travels South Lamar. When Nathan Wilkes from the city’s bicycle program gave his part of the presentation, he spoke about the gains of combining public transit and bicycles. Austin is slated for future high speed commuter rail lines, like the green line that will go to Manor someday and the Lone Star rail along the Mopac corridor. Providing bike lockers and a shared bicycles could allow for easier commutes. Bike to your station, lock your bike, take the train into town, grab a shared bike at the station and bike to your final destination. Wilkes claims they will be rolling out the bike share system sometime mid year. For the full Think Bike presentation, you can watch a video provided by the city of Austin.